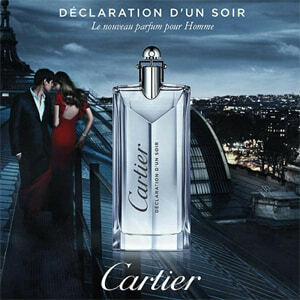 Cartier Déclaration d'Un Soir is an ode to the allure of the night, with its many possibilities and passions. It is a fresh, spicy, woody cocktail that can only be described as a love potion, crafted from the energy of pepper, the elegance of sandalwood, and a touch of romantic rose. Déclaration d'Un Soir is an alluring fragrance created for a charming man, one with a keen power of seduction and a penchant for beautiful people and places. The secret weapon of the sophisticated gentleman.